I’m thrilled to introduce you to Mary Kay Beauty Consultant and my friend, Amy Wilson. Amy is a phenomenal wife and mom whose goal for this year is to become a Mary Kay Director or at least in qualification. What would make this even more special is, we believe she would be the first blind director. Without further ado, here’s Amy! Hello, Beauties! My name is Amy Wilson and I am a Mary Kay Beauty Consultant. I am also blind. Through my business, I’ve learned basics are not taught enough, so here we go. If you don’t know where to start with this then feel free to reach out to me and I will give you my advice for free. With so many options it’s had to know what to do. Foundation is tough to match but luckily there are CC Creams (complexion corrector creams). These will blend to match your natural skin tone. I think some of these are also called BB (blemish balm) creams. You can apply these foundations with your fingers or to make the product last longer use a liquid foundation brush. Cuz who doesn’t want to make makeup last longer lol. Tip when applying foundation make sure you go past your jawline. You don’t want to look like you are wearing a mask. Cream eyeshadow is a basic eye makeup. You know, something you can apply with your finger so you know where the heck its going. There are all sorts of colors you can use made by a variety of companies. If you are under 25 you can use shimmer but over that use a matte color. As we age our eyes are the first thing to show our age so having shimmer will make you look older than you want. No Bueno. No good. There are so many different types of mascara its crazy. Start with a basic one. Apply with the brush horizontally not vertically. Practice, practice, and practice some more. Have some eye makeup remover handy because I guarantee you will mess up. This happens to anyone when they are learning. I could do a blog just on mascara. For color on the cheeks, you can take it or leave it. I went years without wearing any because I wasn’t sure what color to wear. Powder or cream blush is a great way to add some color to your face in a simple way. Have fun with it. There are so many different colors out there. If you’re not sure where to start, try a red or pink, these colors look great on everyone. Personally, I love my crushed berry red. Again, I could do a blog on just this topic. Just have fun with it. Stay fresh and fabulous Bold Blind Beauties. If you want to connect with me you can find me on Facebook under Amy Wilson or join my group Wilson’s Wildflowers. 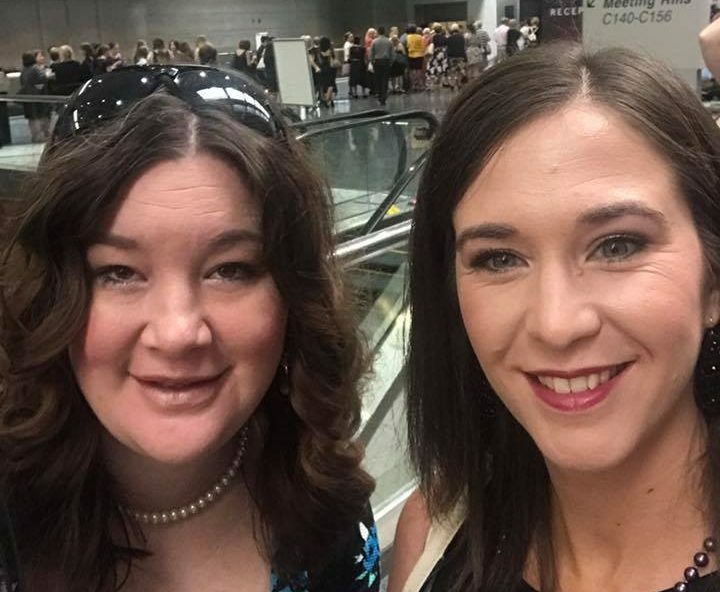 Two brunette beauties, Amy is posing with a friend as a first-time attendee at the 2018 Mary Kay Seminar. Amy’s sunglasses are on top of her head and she has a strand of pearls around her neck. Amy is sitting in a mini coop that you can earn as a Mary Kay consultant. Her white cane is hanging out of the driver side window with Amy sitting in the driver seat. I never knew about shimmer making eyes look older! I’m going to pick up some cream matte eyeshadow ASAP. Best of luck to you in reaching your goals! Thanks for sharing your expertise.